This article is about the Kleenex brand. For the band, see Kleenex (band). For the generic item, see Facial tissue. The first Western facial tissue, introduced in 1924 and originally marketed as a way to remove cold cream (it had been in use for centuries before in Japan; see History of facial tissue for details). It was a disposable substitute for face towels or cotton wool. In 1925, the first Kleenex tissue ad was used in magazines showing "the new secret of keeping a pretty skin as used by famous movie stars...". A few years after the introduction of Kleenex, the company's head researcher tried to persuade the head of advertising to try to market the tissue for colds and hay fever. The administrator declined the idea but then committed a small amount of ad space to mention of using Kleenex tissue as a handkerchief. By the 1930s, Kleenex was being marketed with the slogan “Don’t Carry a Cold in Your Pocket” and its use as a disposable handkerchief replacement became predominant. In 1943, Kleenex began licensing the Little Lulu cartoon character to popularize the brand. The original Kleenex trademark application at the United States Patent and Trademark Office (USPTO) was filed in the class of Medical, Beauty, & Agricultural Services by Cellucotton Products Company of Neenah, Wisconsin, on Saturday, July 12, 1924. The description provided to the USPTO was "absorbent pads or sheets for removing cold cream". The first use for the drawing and stylized word mark was on June 12, 1924, and its first use in commerce on June 12, 1924, as well. USPTO granted trademark registration on November 25, 1924. International Cellucotton Products Company officially assigned trademark interest and good will of the business to Kimberly-Clark Corporation on September 30, 1955. Kimberly-Clark Corporation of Neenah, Wisconsin is the current registered owner of the Kleenex trademark. In the USA, the Kleenex name has become—in common usage but not in law—genericized: the popularity of the product has led to the use of its name to refer to any facial tissue, regardless of the brand. Many dictionaries, including Merriam-Webster and Oxford, now include definitions in their publications defining it as such. ^ "Toilet Paper History – Complete Historical Timeline". The Complete History of Toilet Paper, Unabridged: "In 1924. 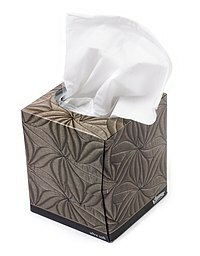 Kleenex is introduced by Cellucotton and first marketed to women as a disposable towel to use when removing cold cream." ^ Kleenex history "Kleenex Brand Story" Check |url= value (help). Kleenex.com. Retrieved 2010-06-26. ^ "United States Patent and Trademark Office, registration #s 0019194;0022859;0029753;0038458;0408618". 1924-06-12. Retrieved 2010-06-25. ^ "Kleenex". Retrieved April 9, 2018. Wikimedia Commons has media related to Kleenex.